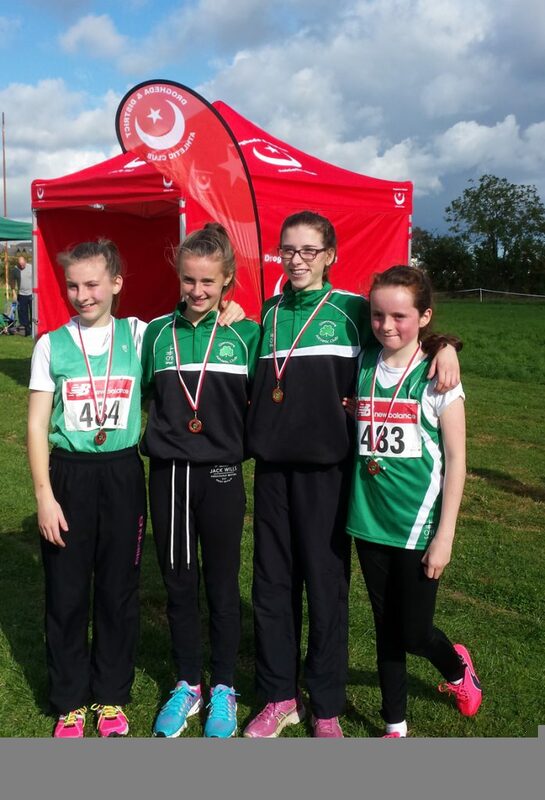 Glenmore athletes travelled to Meadowview in Drogheda on Sunday to compete in the first cross country outing of the season, the Louth juvenile even ages and senior novice championships. First out were our men’s team who ran a great race in perfect conditions, Shane Lynch was first home in 4th position followed by Martin Toner, Kevin Harnett and Gavin White. Tadhg Leahy finished strong in the U18 boys who ran in tandem with the novice men. Shane Toner and Katie Bell competed in the Kileavey 10K & 5K today also with Shane taking gold in the mens 10K. The juvenile races started with U8, Aoife McDonald and Isobel Gill ran in the girls race and Ronan Dunne in the boys. The U10 girls had a strong representation from Glenmore in the 800m with the first four girls home taking the bronze team medal. Jessica White led the Glenmore girls home followed by Emma Mc Carragher, Grace Keenan, Ellen Callan, Katie Mc Donald, Sarah Murphy, Leah Dunne and Aoife Keenan. Craig Touhy just missed out on a medal in the boys U10 finishing a strong 4th, followed by Aaron Hanratty, Ultan Gill and Cian Mc Gee. U12 girls ran 2000m with Lisa Conlon taking 4th position and Lucy White, Anna Dawson, Ava Brady and Emily Touhy all competing. Our U14 girls ran 3000m and finished in top team position taking the gold medal. Laoise Mc Elroy finishing 5th , Anna Mc Ardle 6th, Katie Conlon 7th and Blathnaid Murphy 8th. The U16 & 18 4000m races were ran in tandem also. Katie Mallon took the bronze in the girls U16. Sarah Mac Erlane took the silver in the U18 followed home by Hannah Stewart. Our Boys U16 team took the silver medal with Niall Brady leading the team home, followed by Eoin Mc Cann, Andrew Moore, Craig Kane and Ciaran Flynn. This proved a very successful day for all our athletes and sets them all up perfectly for the Glenmore AC juvenile races next weekend at 12.00 midday, the curtain raiser to the Kearney and Mc Bride 5K chipped road race at 1.00pm. Full details on registration are on here. Online registration is now open €15 online or €20 on the day. Refreshments will be served in the canteen on the day. All welcome.